My TV is smarter than me. | Turning my world upside down! My TV is smarter than me. 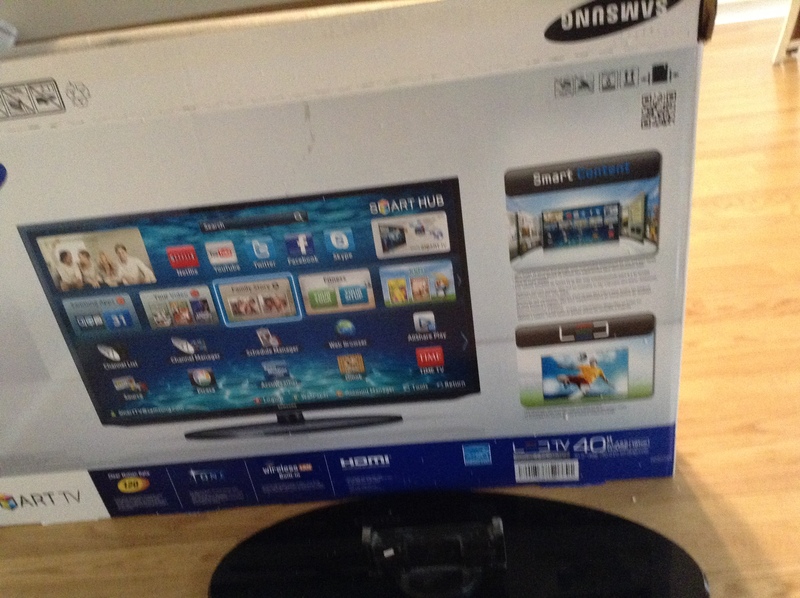 Leon and I went to buy a TV to replace the nice 42″ Samsung TV I had bought my children in 2008 as a housewarming gift. After all, when your teenage daughter is moping because she has to move away from the only house she’s ever known, you do what is needed to bribe her. Simple parenting skills, right? At any rate, we ended up in the electronics store where I had a very good idea what I wanted to buy. I figured I would just replace the existing TV with the exact same thing. They have come down in price considerably since I bought the last one in Montana and carted it all across the continent back to Ottawa. I had saved the sales tax by shopping in a tax free state. That may not seem like much to you, but for me, that’s a 13% savings! We started to look around at the TVs and found a great sale on a 50″ plasma. It was much larger than we needed but it seemed like a good deal. But wait! The LCD 40″ was what I had come for and after enquiring, I was still sure it was just what I wanted. So the nice salesman grabbed one off the shelf for us and was following us to the front of the store when I got distracted by a display for a SMART TV. I enquired as to what exactly a SMART TV could do for me. Of course, as soon as the salesman replied that I could search the net, watch Youtube movies or use Netflix on the TV, I was sure it was exactly what I needed! No, I don’t watch Netflix and I don’t often watch Youtube, but I spend a lot of time on Facebook and other social media. But for real entertainment, Leon and I look at realty ads online, checking the housing market in Ottawa and the lower BC mainland, mostly. If you are my age, you will appreciate that reading glasses are now my most important accessory, without which I cannot decipher the most basic of labels, crosswords, student assignment and especially real estate ads!! I am always asking Leon to adjust the distance of the monitor on his laptop as we are both at different levels of farsightedness. So, with that in mind, you can imagine how excited I was to think we might finally be able to surf the net together and look at those ads in glorious 40″ screen detail. And so, we brought the Smart TV home, Leon wondering if there was anything in the box, it was so light. We had this great idea that we would put the old TV in the new box and fool the kids into thinking they were getting a new TV. You know, the new TV is so much smaller. We can’t believe the difference! Once installed, it was time to figure out how to set it up. We now have it set on the wireless mode so that it operates just like one of our laptops. But we haven’t figured out any of the other features. Some of them are rather important, like how to set the volume so it doesn’t sound like the actors are talking inside a tin can. I tried to use the on-screen keyboard and it took me about 10 minutes to type in my Facebook login and password. Of course I pressed the wrong button and lost everything I had just typed, twice!! In the end, I gave up trying to use any of the SMART TV features as it was past 10pm and surely past my bedtime! OH NICEEEEEE!!! Good work there on buying it. Enjoy 🙂 How did the surprise for kids turn out? They were not surprised at all as we couldn’t fit the old TV in the new box very well. Spent the later part of last evening trying to get to know the TV better. I don’t think it is going to become a member of our family without a struggle. I suppose that will give me more time for blogging, right? As a retired teacher I feel I should be able to purchase and use any item I want. But the fast pace of technology stops me every time. Now I can only purchase if they will send someone to install and make it work. Well worth the extra money for me! Now trying to figure how to use word press and blog. Enjoy reading yours! Thank you! I tried to find out more about you on your blog but couldn’t. Nice to meet a fellow teacher. Nawww, it’s probably smarter than you too. You’d just get frustrated. I will have to get Leon’s son to sort it out for us. Is technology great! I’ve been working on a travel map for my blog, actually several map applications. All you have to do is create the map with your travel info, save it and copy and paste the (html code) in your blog and it’s a done deal! Isn’t that simple? A week later I’m still pulling my hair! Great blog…keep writing! Thanks! Have you tried ZeeMaps?